Folk who regularly follow this blog will know that Toby is a late bloomer when it comes to his speech. After a course of antibiotics before Christmas he suddenly started talking, and this is a little post about one of the activities I do with him to ensure he gets focussed time during each day to speak and be heard. With older brother Ollie engaged in the excitement of cutting up stuff with his own little scissors, Toby and I spent some quality time with a clothes catalogue. I touch Toby's face to get his attention and say 'Toby, can you choose clothes for Mummy?' (while signing 'clothes' and 'mummy' in Makaton) then started to leaf through the catalogue saying 'this one for mummy?' and waiting for his response. He says 'no - ah' and gives me a cheeky look until we get to something he likes. 'Da' he says pointing. I cut the dress out that he has chosen, then he glues it with a gluestick and sticks it on to card. I say 'I like that dress, that is a pretty dress, thank you' (I sign 'good' 'clothes' 'thank you'). I draw on a round head to give him the idea we are drawing now and say 'Toby, can you draw hands for Mummy?' (signing 'draw' and wiggling my fingers because I can't remember what the sign for hands is). Toby chooses purple for my hands and scribbles in the right places. I say 'yes, there's mummy's hands' (signing 'yes' 'mummy' and wiggling my fingers again). We repeat this for feet and hair, then go back to the catalogue to choose shoes and a bag, all the time catching Toby's attention to look at me when I speak to him and signing the main words. Toby takes a long time choosing just the right shoes and bag, and when we find a page with shoes he likes points and says 'da, shoe' and 'da, bag'. I praise and model what he is saying 'those shoes' and 'that bag'. We don't correct, just repeat back what he is saying as we would say it. 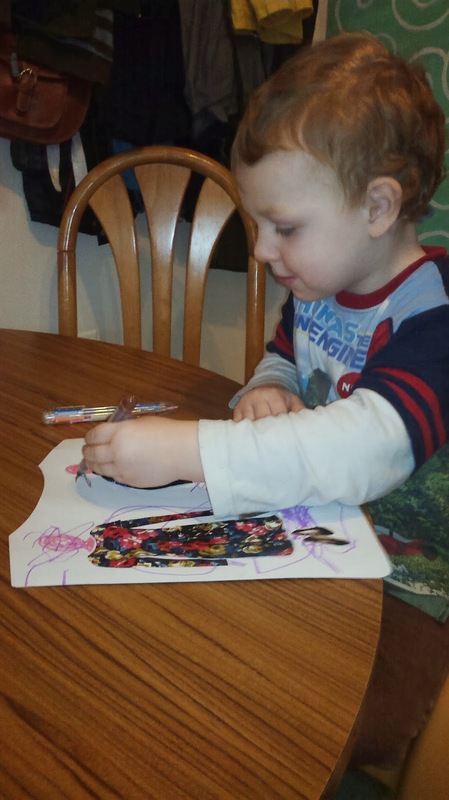 With the picture finished he proudly says 'look, mummy' which is brilliant as he is now forging ahead with new words and with using words to make simple sentences. 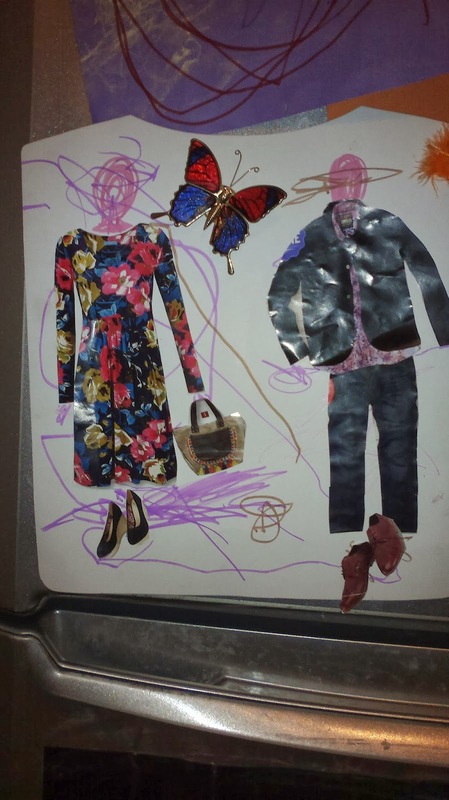 Toby then says 'an Daddy', so I'm happy that he is enjoying this and wants to do a clothes picture of Matt too. We repeat the process again. Toby spends even longer picking Matt's outfit. When both are finished we run through what we have a few times in his favourite 'where's the...' game. 'Where's the dress' etc... is good for showing understanding and feeling good about themselves but I'm consciously pushing a little more now for more than pointing so I look puzzled and point to the lady and say 'who's that', Toby says 'Mummy! ', 'and who's that? ', 'Daddy!'. 'Toby, what's that?' 'A Bag!' he shouts. This is a specific example, but it can easily be adapted to any activity your little one enjoys doing with you. It is also specific to my little lad's speech delay, but is great fun to do with younger children with no speech delay, or even older ones as it is something you can lead into other skills such as literacy. For example, write the words for the clothes and get your child to draw lines from the word to the picture, or take it further by drawing a line yourself and a box for them to write the word in. Do it in another language if that's what you're working on - it's the mixture of choosing, cutting out, sticking and talking that keeps the child interested in a way that flash cards never could. This is really simple stuff, but for a little lad who could only say about six indistinct words a couple of months ago it is really exciting. Funnily enough for the little monkey one of his first words was 'tuck!' (stuck, as in stuck up on top of something). Hearing him say 'baubles' and 'tree' at Christmas was astonishing, and to jump from that to the simple sentences he is using now is beautiful to watch. His first sentence was 'ju ju daddy' - 'thank you daddy', copying his big brother being given a drink. Currently his longest sentence is 'hoh choh choh mik' (hot chocolate milk). He is certainly finding his voice, shouting 'mummy mummy mamma mamma mum mum...' for an entire half hour car ride home after he dropped something. I kept having to remind myself that time that it really was brilliant. I completed an introductory course on Makaton last week and the tutor had lots of wise words that re-enforced what we have been doing, challenged me to do more and informed me with new things to try. One of the things I find really valuable about using signing alongside speech is that it slows me down, makes me discard a lot of the 'stuff noise' that we fill our speech with and make sure I have eye contact and give full attention while talking to Toby. It's something that benefits all kids, not just ones with hearing problems or developmental delays. Children are like sponges for information because they generally have much greater input from their senses than we do, but the flip side to all this extra information is that they process it more slowly than we do. So rather than expecting them to process and respond to us in a way they will not be capable of until after their brain reshuffles during their teens, we need to focus on slowing down, giving them what they actually need to know, and giving them time to process and respond. Apparently their Dads respond well to this approach also. Rumour has it men don't need to know a blow by blow account of who said what to whom with a task we need them to complete cunningly hidden in the middle. Who knew?